At almost age 24, Pauline was the second oldest contestant in Atlantic City, and much older than the other MidWest contestants who ranged in age from 14 to 20. Pauline was one of the three MidWest contestants (together with Missouri and West Virginia) who did win a state pageant, and it had been sponsored by the Wichita Beacon newspaper. Not only did Pauline love her time in Atlantic City, but her husband later loved to proudly introduce her as Miss Kansas to all in Las Vegas throughout their life. In early July there was a Bathing Revue in El Dorado, an annual event, with approximately 40 competitors in 1933, divided into three groups according to age. The winners of each group were awarded prizes donated by various El Dorado merchants. However, the newspaper article did not say if this was a qualifier for the Miss Kansas competition. The July 20, 1933 El Dorado article said that Miss Sayre, a former resident of this town and graduate of the local High School, won first place in the recent Beauty Contest conducted by the Wichita Beacon. As "Miss Kansas" she will represent her state in the big pageant at Atlantic City in September. Before her removal from this town, Miss Sayre was a popular saleswoman for Montgomery Ward & Company. After the coronation as Miss Kansas, Pauline must have left almost immediately for St. Louis, as she joined six other MidWest contestants in St. Louis just days later. She was part of the MidWest Whistle Stop Tour which spent the next 7 weeks touring cities and towns in the MidWest and East, performing to raise money for their expenses on their way to Atlantic City. 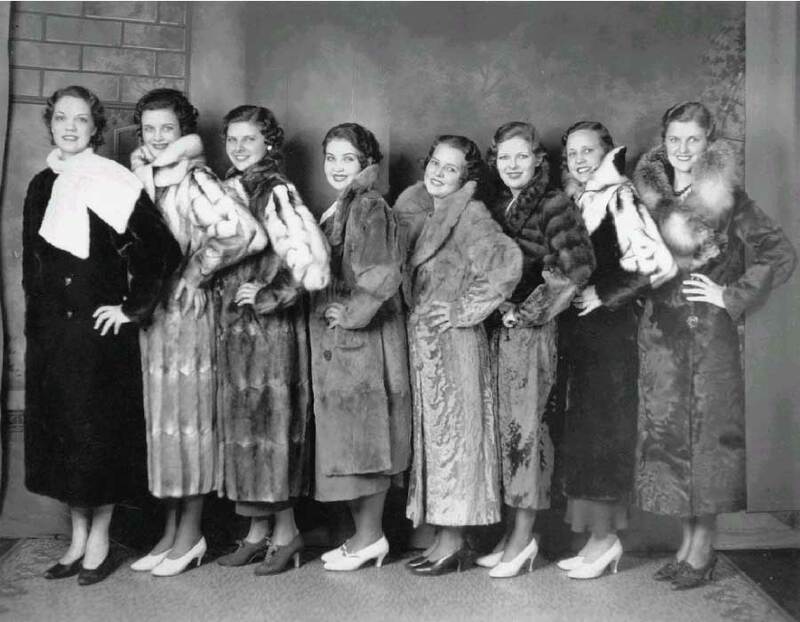 In addition to beauty parades in evening gowns and bathing suits, the performance often included a vaudeville act with the beauty contestants featured in short song and dance persormances; the The Cape Girardeau article on August 1 mentions that Pauline was a singer. While in St. Louis, Pauline, together with Miss Oklahoma, Miss Missouri and Miss Texas partake in the champagne-bottle christening of a railroadcar for the Missouri-Kansas-Texas line, according to the August 9th Denton, TX newspaper. Curiously, Miss Texas never makes it to Atlantic City; this is the only source found to date that even mentions her. 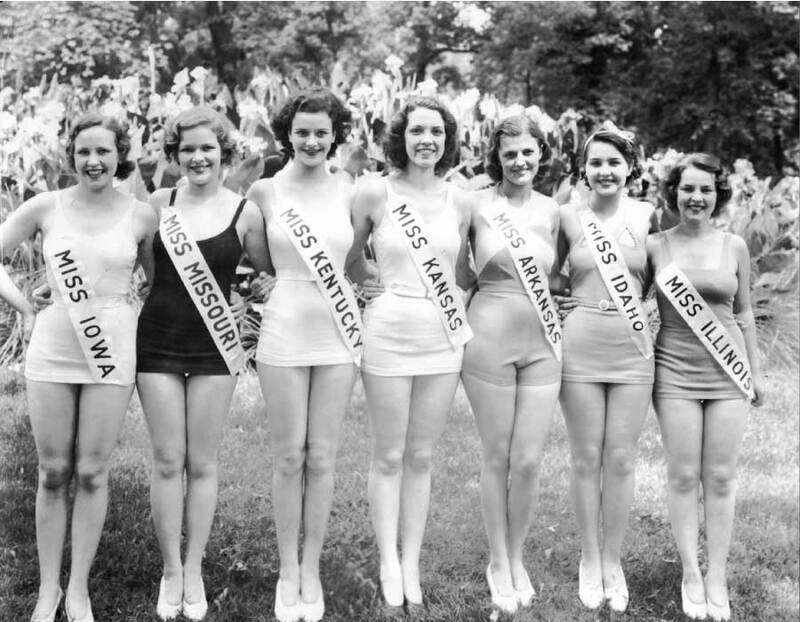 Pauline was pictured in the Sep 6-8 articles nationwide with a picture of six Midwest contestants who visited the Nation's capital; this is thought to be a picture from when many contestants performed at Chevy Chase Lake, a suburb of Washington, DC. The only contestant known to have visited Washington, DC was Miss Wisconsin who made a special trip after the Pageant ended and was received in the Oval Office by President Roosevelt! No specific mention of Pauline was found in the Atlantic City newspapers at the time of the Pageant. In 1940 Pauline is living in Houston, Texas where she works as a payroll clerk in a department store. In 1958, Pauline Sayre is living in Las Vegas, NM, apparently unmarried with no children. Her brother Clarence is living in Denver, divorced, and two of his children have died. Their mother died August 4, 1952; their father died September 1958 in Great Bend, KS. As late as 1955, Clarence and Pauline were both living in Great Bend. [As Pauline is living in Las Vegas, NV at the time of her marriage in 1960, it is assumed that this reference is in error, and it was supposed to be NV not NM.] Pauline is not known to have been married prior to 1960, and had no children.